The 3-star Hotel Buda in Igea Marina is characterized by the centrality of the location and the well-kept rooms with air conditioning, balcony and WI-FI connection. The clients of the structure have at their disposal a private parking lot and many free services at agreed prices. The hotel allows pets. 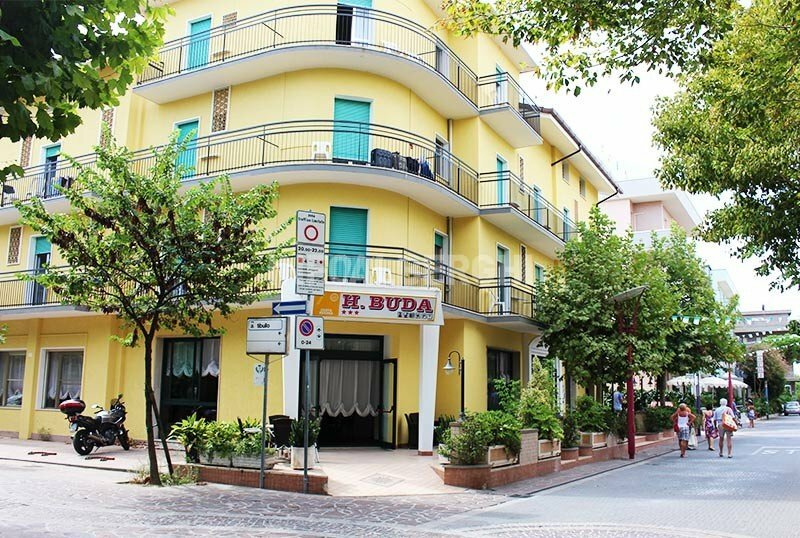 The Hotel Buda is located in the heart of Igea Marina, right in the city center and close to the beach. Ideal for those who love to walk around, the hotel is located in the pedestrian area full of bars of all kinds and shopping shops. On foot or by bicycle you can also easily reach a large city park, Parco del Gelso. The rooms, some of which have a sea view, are equipped with: balcony, air conditioning, LED TV with digital terrestrial, WI-FI connection, direct dial telephone, safe, minibar, private bathroom with shower and hairdryer. The Hotel Buda is characterized by the presence of a terrace overlooking the main square of Igea. In addition, the hotel has a garden, open-air porch, lift, TV lounge with newspapers available, availability of bicycles, reading room, conference room, laundry. Theme nights are organized. PARKING: uncovered and covered, both free. AIR CONDITIONING: free throughout the entire hotel. AGREEMENTS: beach, amusement parks, gym, swimming pool, shuttle service on request. SERVICES FOR DISABLED PEOPLE: entrance with inclined ramp, standard lift. BREAKFAST: sweet and savory buffet with cold meats, cheeses, cakes, fruit juices, hot drinks. LUNCH AND DINNER: 3-choice menu, appetizer and vegetable buffet. Pasta and desserts are homemade. In the hotel: strollers, babysitting service. In the room: cots, bed rails. At meals: high chairs, bottle warmers, baby menus and baby food, flexible hours. The hotel has an agreement with the Bagno 72 bathing establishment which offers entertainment for children (games, songs, workshops and tournaments) and for adults with muscular awakening, group dances, water aerobics, soccer and beach volleyball tournaments. For the Easter holidays, April 25th and May 1st, children up to 12 years are FREE if in the room with two adults in Full Board formula. Come and spend the Easter holidays in the Romagna Riviera, give yourself a stay at the sea with your whole family. Special Promotion 7 days: only € 420 instead of € 560 per person full board. In addition children up to 12 years stay FREE in room with two adults. Discounts for the third child. Offer April 25th and May 1st at the beach! Come to the Romagna Riviera to spend a few days relaxing! Special promotion 7 days: only € 420 instead of € 560 per person with full board. In addition all children up to 12 years stay FREE in room with two adults. Discounts for the third child. Take part in the national event dedicated to fitness lovers! Packages in B & B, prices per day per room. What are you waiting to book? Bicycles and parking for cars are also available. Children up to 12 years stay FREE in room with two adults. 7 days € 924 in a double room. The treatment includes stay in a comfort room with full board with water and wine with meals and beach service with an umbrella and two sunbeds.